Experience a Little Havana orientation with a local tour guide. Little Havana is the closest you can get to being in Cuba outside of Cuba itself. 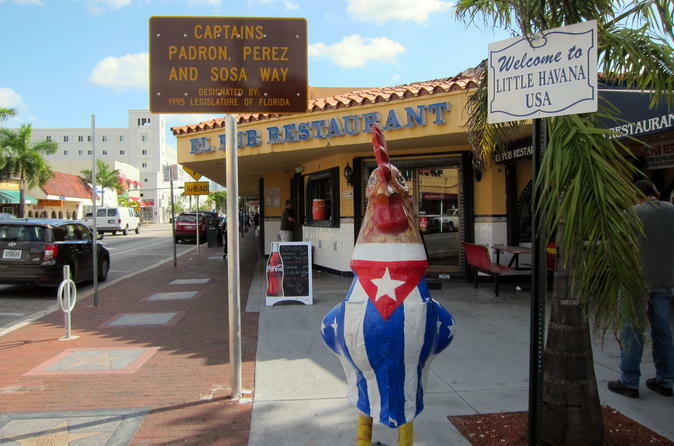 A bustling neighborhood shaped by the Cuban diaspora that overtook Miami since the 1960s, Little Havana is full of culture and cuisine that you simply don't want to miss when in the 305. Your tour will begin with at the Havana Classic Cigar, where you will learn about the history of cigars and cigar-making! From there, we're off to explore the many cultural landmarks and sites that make up this neighborhood. We’ll see the important Bay of Pig monument en route to a favorite local fruit market and juice bar. You’ll experience the Caribbean flavor that fills the air, from the classic Domino Park where locals challenge one another to domino games, to the salsa music that’s played live in the streets. To conclude, we will visit the cultural gem of Little Havana known as the Cubaocho Museum and Performing Arts Center founded by Cuban historian and collector of Cuban artwork: Roberto Ramos. Ramos is the founder of Cubaocho, which features a historic collection of Cuban art dating from 1800 to 1958, famous for its large rum collection and known for its classic mojitos and latin jazz. Here we close this incredible tour listening to the incredible journey of Roberto Ramos who preserved Cuban paintings and cultural history prior to the Castro Regime.